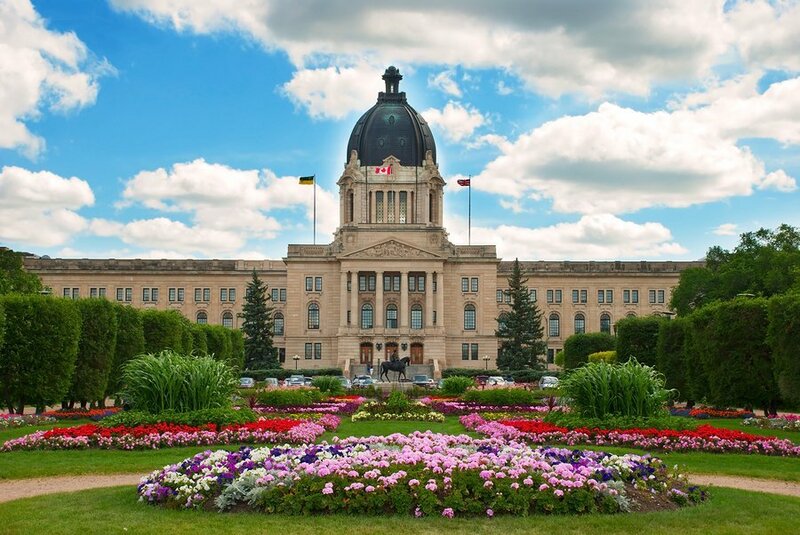 Buying luxury real estate in Regina is a relatively affordable way to invest in the finest experience possible for this vibrant, developing city. Regina is a strong centre for business and entertainment, and its luxury real estate represents fine craftsmanship and efficient design befitting this modern outlook. Less expensive than many other urban centres, and offering large, elegantly designed spaces, luxury homes for sale in Regina are where you want to be. You can discover luxury homes for sale in Regina in the listings directly below, or read more about Regina's luxury real estate. Luxury homes for sale in Regina will allow you to experience the best of this vibrant, conveniently-sized city with comfort and efficiency. Many of the luxury homes offered in Regina are two story constructions, ranging upward of 3000 square feet. A common aesthetic design found throughout the Regina luxury real estate market is the Prairie-inspired modern style, displaying strong horizontal lines, and unadorned exteriors that create interest through a combination of shape and texture. Once inside, you'll marvel at the large open spaces waiting to be put to your own personal use. Theatres, game rooms, workshops, and bars are just a few of the uses that residents have found for the studio-like spaces in these luxury homes. Internal configurations usually boast around 4 to 6 bedrooms, and 3 to 5 bathrooms. These are distributed through well-lit, split-leveled spaces, connected vertically via curving staircases. Other interior features include luxury bathrooms with large soaking tubs, double sinks, and walk-in showers; open-plan kitchens with integrated stainless steel appliances and centre islands; and master bedrooms with walk-in closets, picture windows, and plush carpets. Most of Regina's large, luxury homes can be found in its outer subdivisions, where new developments are offering buyers first-class amenities and beautiful country views, all from the comfort of their own quality-built homes. The Creeks - Located in southeast Regina, homes in The Creeks are right at the very edge of Saskatchewan's vast farmland. And yet, the neighborhood is only 20 minutes from downtown. A new commercial centre is located across the street, and the homes themselves come in a range of new-traditional to modern styles. This is a carefully planned community with design guidelines intended to preserve the sense of a cohesive, well-established community. Wascana View - A select collection of prestige homes in the Wascana area, overlook Wascana View Park. In southeast Regina, this neighborhood is more well-established than some of the newer developments in the area. Some of the largest and highest priced homes in Regina are located in Wascana View. Impressive executive family homes face the wide, tree-lined streets in this impressive community. Landscaped front yards show pride of ownership as you wander past spacious bungalows and bi-levels, exquisite two storeys and splits, and luxurious walkouts. Entering Wascana View real estate, you are treated to features such as grand staircases, beautiful hardwood flooring, gracious fireplaces and large living rooms that open to formal dining rooms. The Greens - This cutting-edge community features fantastic views and lower-level walkouts. The modern homes are built with the best energy-efficient features, and the occasional custom home here adds a character feel to the neighborhood. Greens on Gardiner showcases elegant bungalows, spacious two storeys, unique bi-level homes and executive walkout homes backing green space. Homes have access to an extensive system of lit walking paths and 40 acres of green space plus environmental reserve. If you are looking for a quality built home in East Regina, then Greens on Gardiner is the perfect place to call home. Harbour Landing - This community offers the perfect home and lifestyle for you and your family. Real estate in Harbour Landing is seamlessly mixed with spacious walkouts, luxury homes backing green spaces, single-family homes, duplexes, townhomes, garden condos, and apartment-style condos all among luscious park spaces and 16 kms of walking paths. The deliberate focus on street scapes and tree lined boulevards with a tastefully integrated commercial centre makes the vibrant Harbour Landing community a “must live” destination. Conveniently located in the south-west corner of the City of Regina, this unique community is in close proximity to the Regina International Airport, downtown, and the University of Regina. Spruce Creek - Located east of Regina near the town of Pilot Butte, Spruce Creek is situated around two small lakes, and offers properties with generously sized lots. Properties tend to display more than 3 garages, pronounced cornice returns, tall entryways, and stone accents. Just north of Highway 1, this neighborhood is conveniently located, while far enough form the city for a more quiet atmosphere. White City - A growing community east of Regina. Homes around this town cater to a diverse mix of individuals and families, most of whom commute to Regina. White City is a progressive, family friendly community and features many newer homes, as well as some homes on larger lots and acreage lots. There are many great homes in this area, including luxury properties with carriage drives and tennis courts. The extensive greenways are also a highlight for those who enjoy the great outdoors. FIND YOUR PERFECT REGINA HOME FAST! By registering with our website, you'll gain access to the latest Regina real estate listings the minute they become available! Registration is quick and free! Join now to receive email alerts to new listings of Regina properties that match your criteria, save your favorite listings, request viewings and more! Register today to gain access to the latest tools in Regina real estate.